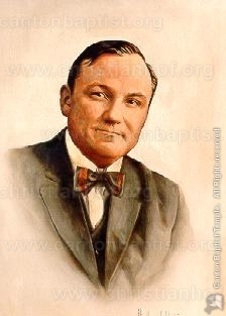 Paul Rader, evangelist and pastor, was born in Denver, Colorado, the son of a Methodist minister. He was converted to Christ as a boy and became a soloist in his father’s meetings. He was educated at the University of Denver, The University of Colorado, and did post-graduate study at Harvard. During his time in college he drifted into liberalism and entered a business partnership. While walking near Times Square in New York City, God spoke to him through an illuminated sign. He rented a room nearby and fell on his face before the Lord where his life was changed. He left his business and entered the ministry. His pastorates included Congregational Church in Boston; Christian and Missionary Alliance Tabernacle in Pittsburg (1912-15); Moody Memorial Church in Chicago (1915-21); Chicago Gospel Tabernacle (1922-33); and, Gospel Temple in Fort Wayne, Indiana (1936-37). He served as President of the Christian and Missionary Alliance from 1921-23. His radio broadcasts were heard on various Chicago stations as well as the CBS Network. He was instrumental in sending scores of missionaries to countries all over the world in addition to influencing hundreds of young men to enter the ministry.